The Susquehanna River meanders 444 miles from its origin at Otsego Lake near Cooperstown, NY until it empties into the Chesapeake Bay at Havre de Grace, Md. The Middle Susquehanna River Trail covers 54 miles of the river from Sunbury downstream to Harrisburg. Along this route, boaters, canoeists and kayakers can explore the great river and its diverse scenery and habitats. River otters, beavers and other mammals are sometimes seen from the river. In May, many birds dot the landscape as spring migration is at its peak throughout the trail. Birds of prey - such as hawks, eagles, osprey, vultures, and owls - show up along the ridges and throughout the river valley much of the year. Canoeing, kayaking, boating, camping and other river-related outdoor activities have inherent risks. The river environment (moving water, cold water, deep water, tricky currents, rocks, poison ivy, ticks, etc. ), weather extremes (cold, heat, electrical storms, wind, etc. ), and man –made structures (esp. dams) pose potential hazards. The river trail user should familiarize themselves with these hazards and have or obtain adequate skills to safely experience the river environment. Your safety is your responsibility! Remember: safe use of rivers and any designated trails, at any time, is your responsibility! Trail maps are for informational and interpretive purposes only and are not meant for navigational purposes, nor do they take into account level of skills or ability required to navigate such trails. The Chesapeake Conservancy, National Park Service, and/or the individual trail associations assume no responsibility or liability for any injury or loss resulting directly or indirectly from the use of trails, maps or other printed or web-based materials. Access points to the Susquehanna River Trail are open from sunrise to sunset. There are no fees to access the Susquehanna River Trail. The lower 26 mile segment of the trail is accessible at three formal trailheads and at other municipal or private access points. Harrisburg's City Island is the terminus for the trail. (Caution: All boaters must exit at City Island to avoid a dangerous low-head dam.) The normal summer flow of the Susquehanna River along the length of the trail accommodates small, shallow draft, powered, and nonpowered craft. Avoid the trail when the river level in Harrisburg is predicted to be over six feet. The river presents many obstacles, including rocks, rock ledges, trees, sandbars, and dams. Anglers can fish for muskies, walleye, smallmouth bass, panfish, catfish, and carp. This stretch of river is renowned for its fantastic smallmouth bass fishing. (Note: PFBC Big Bass regulations are in effect for this stretch of water.) Fishing is best around sunrise and sunset. Haldeman Island, a 990-acre island that serves as a rearing location for young eagles brought to Pennsylvania from Canada as part of the eagle restoration program. Don't plan to climb ashore, since the island is closed to all human activity. Clarks Ferry Bridge, where the Appalachian National Scenic Trail crosses at the midpoint of the its 2,155-mile route. Dauphin Narrows/Statue of Liberty, the most difficult section of the River Trail. Stay far to the left when traveling downstream, and exercise caution. To your right, you will see a 25-foot replica of the Statue of Liberty constructed out of wood, metal, and fiberglass by a group of Harrisburg area citizens. Fort Hunter Park, a 37-acre county park and 19th century house that mark the site of an important frontier fort during the French and Indian War. Rockville Bridge, the longest (3,280 feet) stone-arch railroad bridge in the world. More than 30 trains cross over its 48 arches every day. McCormicks Island, one of the largest islands on the River Trail. The southern tip of the island is a great stop for an afternoon picnic. Wade Island, Pennsylvania's largest multi-species rookery (nesting island). You'll see great egrets and black-crowned night herons. The island typically contains hundreds of nests. It's illegal to trespass son the island, so enjoy the sights from your boat. Sheets Island, a state natural area that contains a bottomland hardwood forest and ruins of a farmstead...sometimes visible at the north end of the island. City Island, a 64-acre regional recreation site that connects to downtown Harrisburg. Boating regs mandate that you bring a flotation device for each person, an anchor light, some sort of daytime running lights, and a whistle or other sound-producing device. All boats, including canoes and kayaks, using the formal trailheads must have valid registration. You can camp along the river trail, but you must dispose of human waste and leave rocks, plants, and trees as you found them. 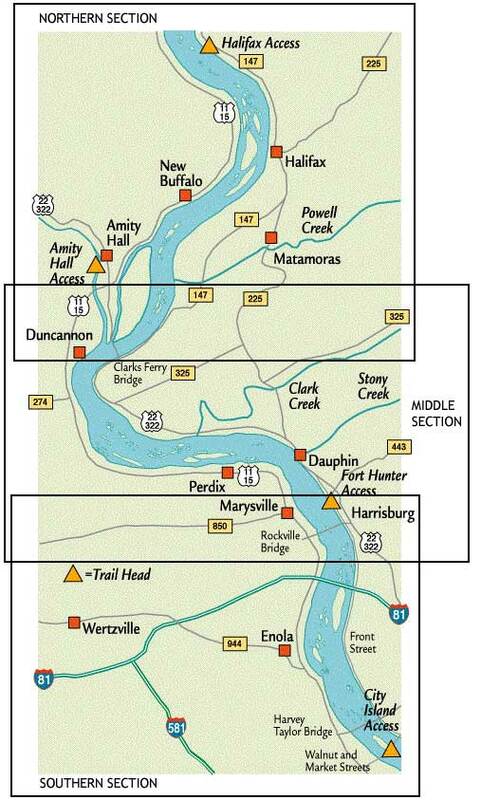 The Susquehanna River Trail features three formal trailheads with portable bathroom facilities. City Island at the end of the trail also offers portable facilities as well as flush toilets. Primitive island campsites maintained by SRTA. Susquehanna River Trail’s access points are handicapped accessible, and the portable bathroom facilities include handicapped-accessible toilets.